When finishing your basement there are a few things to keep in mind as to what you should and shouldn't do. Here at Total Basement Finishing of Connecticut, we can explain to you our many different design options and help you create the basement space you've always wanted. We specialize in basement finishing for homes throughout the Connecticut and Westchester County area including Stamford, Norwalk, Yonkers and nearby. Call us today to schedule a free consultation and on-site estimate! Eliminate moisture - Moisture can ruin your basement, which is why it's smart to waterproof your basement before finishing. When water enters your basement it can create dampness which presents the opportunity for mold to grow. By installing a SaniDry™ dehumidifier, Total Basement Finishing of Connecticut can eliminate moisture while cleaning the air in your basement. Stress to figure out every aspect - Here at Total Basement Finishing of Connecticut, we can give you an accurate depiction of what your basement will look like with our integrated software. However, after we finish the project, the little details are yours to decide. You can add custom furniture, pictures, posters, and other decorative elements without the fear that they will be ruined over time. All of our wall, ceiling and flooring options are resistant to moisture, mold and rot. They also have neutral appearances, allowing you to decorate how you please. Question the investment - Your basement will significantly add to the value of your home. Whether you plan on selling your home or not, you now have a beautifully finished space that can be used for virtually anything. This added space can be extra living space or a room to store all your most valuable items. A finished basement by Total Basement Finishing of Connecticut will not only last long, but it will be an investment you wish you never questioned! Total Basement Finishing of Connecticut is your local basement finishing specialist in Springfield, New Haven, Danbury, Mount Vernon, Greenwich, Westfield, Holyoke and nearby. Call us today for a free estimate on your basement project today! 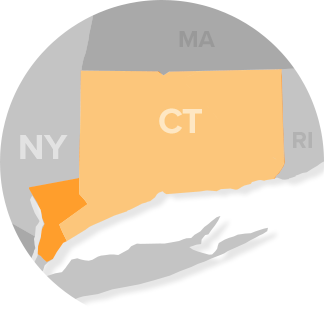 We can get you started with a free estimate and explain to you our many different services available throughout Connecticut, New York and Massachusetts.